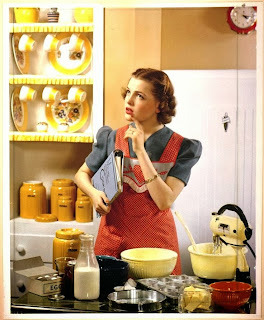 I can not begin to explain how much joy I get, when I stumble upon these vintage kitchen images. All located in Pinterest. 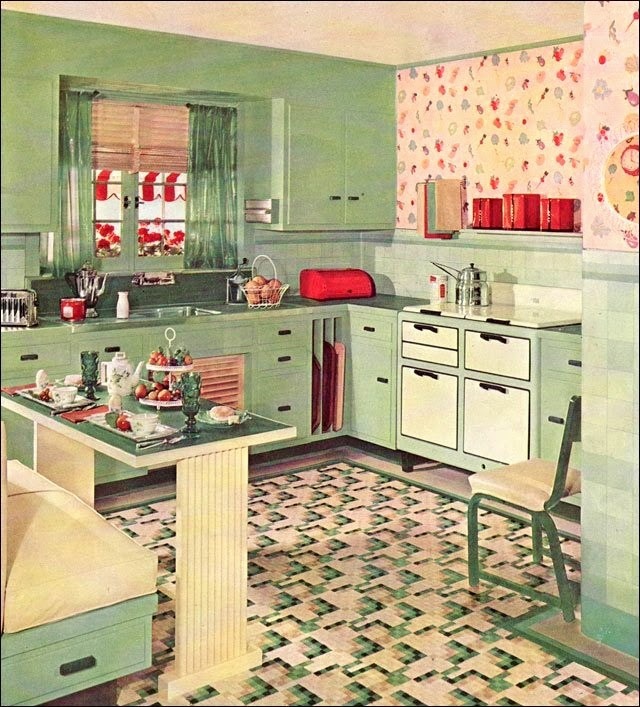 Both from a vintage Armstrong Flooring catalog. I am so underwhelmed with what passes for a pretty kitchen now a days. I have been looking at homes for sell, for far too long. And I have been excited maybe 5-6 times with a kitchen in all of the homes I have toured. But as I have been looking at homes... 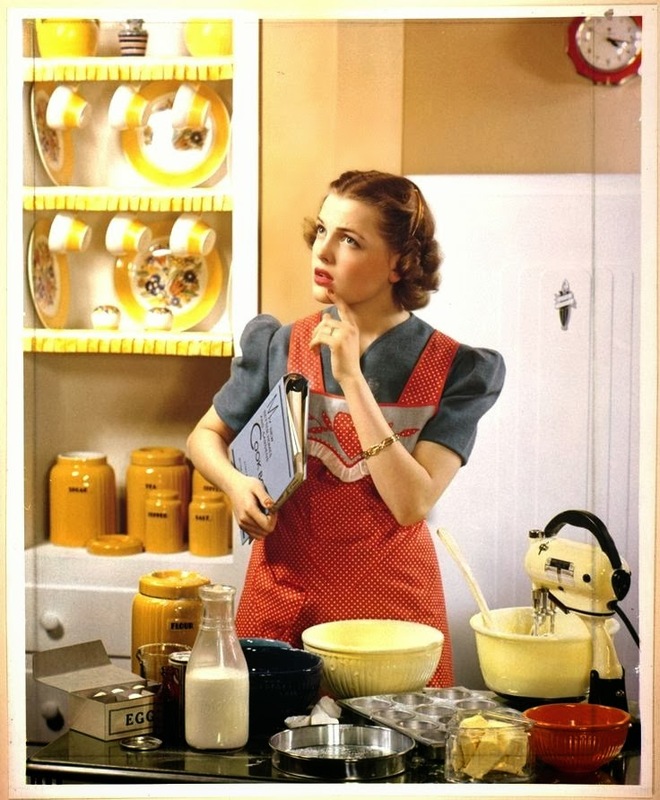 I have been also lurking around Pinterest for ways to kill off the ugly and bring out the pretty in a kitchen. 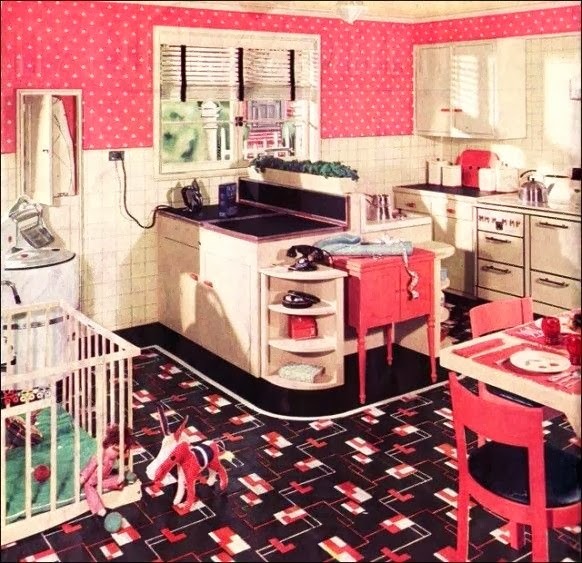 And these vintage images from Armstrong Linoleum are divine. This wonderful pale green... with a hint of jadeite is something I would love to have. It even beats out the pink polka dotted kitchen. For I do love vintage pink kitchen stuff! 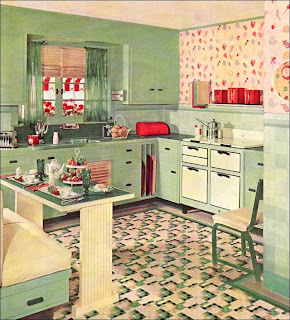 It goes back to my original love for green and yellow kitchen stuff. And I do have some nifty vintage green and yellow things in the collection. There is so much pretty in this picture. And I rarely come across full color images from the 1930's. But look at that yellow Mixmaster! With its matching mixing bowl! Love it. Plus there is that set of pottery mixing bowl set done in yellow, navy and orange.